MIAMI, Florida, October 25, 2012 (ENS) – Hurricane Sandy howled across the Bahamas on Thursday as a powerful Category 2 storm, packing winds up to 105 miles per hour and moving north at about 20 mph. The storm is forecast to reach the northwestern Bahamas and be felt in Florida tonight, says the U.S. National Hurricane Center. All Bahamian government offices, airports, seaports, bridges and public schools were ordered closed Thursday and Friday as a precaution; only emergency personnel remain on duty. The storm is moving northward, triggering hurricane watches and tropical storm warnings for southeast Florida. 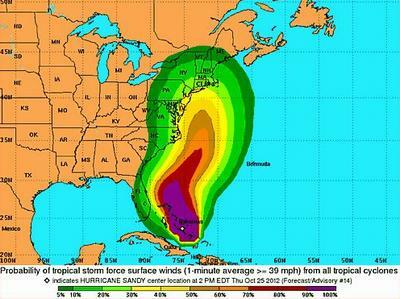 NOAA’s National Weather Service says Sandy is expected to produce storm conditions along the east coast of Florida tonight and Friday. In the past 24 hours, Sandy has swept across Jamaica, Haiti and Cuba, claiming four lives. 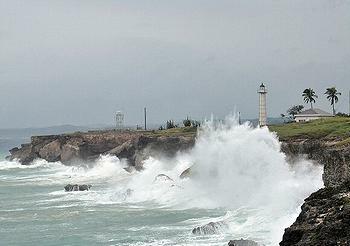 The U.S. National Hurricane Center said Sandy struck Cuba’s northeast coast around dawn. The high winds have knocked out power to all but emergency facilities on Guantanamo Bay Naval Base and halted the Pentagon’s war crimes tribunal. No injuries were reported. Overnight hundreds of houses were destroyed in and around the city of Santiago de Cuba in the eastern part of Cuba. Nearby coastal residents reported waves as high as 32 feet, with water rushing as far as 115 feet inland. Two of the storm-caused deaths occurred in Haiti; a woman drowned trying to cross a flooding river in Camp-Perrin and another died in the small town of Coteaux, AFP reports. Today Haiti is on “red alert” with all schools closed. Jamaica’s Prime Minister Portia Simpson Miller cut short her official visit to Canada to lead hurricane preparations, returning to Kingston on Tuesday. 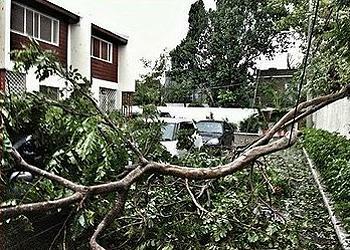 Hurricane Sandy ripped through Jamaica’s eastern parishes Wednesday causing one death. A 74-year-old person was killed when a boulder dislodged by the storm struck a house, “The Gleaner” newspaper reports. At least 1,500 Jamaicans moved to emergency shelters. Police have ordered a 48-hour curfew to deter looters. Jamaica’s electricity provider, JPSCO, said the storm knocked out power to 70 percent of its customers. The entire parishes of Portland, St. Thomas, St. Mary and St. Ann lost power as critical elements of the transmission system were damaged. Repairs are ongoing. In Costa Rica, officials said heavy rains from Sandy damaged roads, left villages cut off and triggered landslides Thursday, but there were no injuries or deaths. In the United States, Tropical Storm warnings are now in effect for Florida’s east coast from Ocean Reef to Flagler Beach and Lake Okeechobee. A Tropical Storm watch is in effect for the Florida east coast from north of Flagler Beach to Fernandina Beach; for the Florida Upper Keys from Ocean Reef southward to Craig Key; and for Florida Bay. The National Hurricane Center gives Sandy a 70 percent chance of blowing north from Florida along the Atlantic coast. Otherwise, the storm would turn east and move out over the Atlantic Ocean. Weather forecasters are warning that Sandy will strike the mid-Atlantic coast and points north, making landfall early next week between Virginia and Nova Scotia. AccuWeather meteorologist Elliot Abrams said, “Some computer models are saying the storm will come into the shoreline at Delaware and southern New Jersey. If that happens, we could have tropical storm or hurricane-force wind gusts, flooding rains and quite a bit of flooding along the coast. Some forecasters are warning of an unusual situation in which Sandy, moving north along the Atlantic Seaboard is hit with cold air coming in from Canada. This could bring snow to the New York-New Jersey area. “It gets more interesting as we get closer to the weekend,” said Bob Adriance, director of damage avoidance with the Boat Owners Association of The United States, BoatUS. “Regardless of whether Sandy meets up with the Great Lakes cold front for a storm of ‘historical proportions’ as one weather blogger put it, heavy rains and gusty winds could impact much of the Northeast,” said Adriance. where from the mid-Atlantic to New England, moving up your winter haul plans before the storm arrives would be a good idea,” Adriance said. The Atlantic hurricane season continues through November 30.